The redevelopment of the former Radcliffe Infirmary site on the Woodstock Road (masterplan by Niall McLaughlin, 2008). Following completion of the John Radcliffe Hospital, Oxford University purchased the Radcliffe Infirmary site from the NHS in 2003 and gained possession in 2007. The site lies between Woodstock Road and Walton Street, with Somerville College to the south and Green Templeton College (which owns the Radcliffe Observatory) to the north. At 10.4 acres it was one of the largest remaining development sites in the centre of Oxford. A design competition resulted in the selection of Raphael Viñoly Architects to prepare a masterplan for a university campus scheme of research and teaching buildings, incorporating landscaped public routes and spaces, to be developed over the next 20 years. Niall McLaughlin Architects were appointed to coordinate the plan. 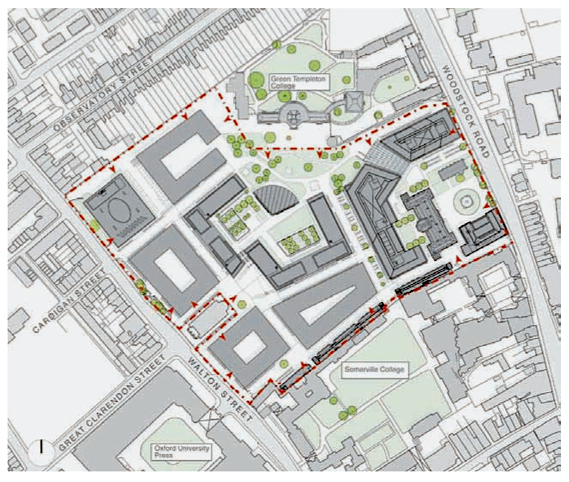 There are four additional development blocks shown in the masterplan, including a large plot in the centre of the site intended for a new Humanities Building and Library; the future of the block on the north-west boundary, currently the Harkness and Gibson Buildings, is undecided.